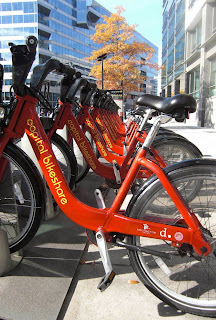 All over the Washington DC area, small battalions of red bikes have popped up. Capital Bikeshare has been a big success. They are handy for tootling around the park or picking up a few items from the grocery store. Would-be riders race each other to claim the last one in the neighborhood rack, with the winner pedaling off, hoping there will be an available parking space in the rack nearest to his office. On a bright, windy day, the autumn-tinged trees and the row of bikes added a jolt of color and cheer to what is usually a monotone concrete and glass city.